Do you suffer from sore or overworked joints? Or do you have a heavily physical lifestyle which puts them under a lot of strain? If this sounds like you then you can benefit from this Blessed Herbs joint pain supplement. Joint Relief is a natural herbal supplement designed to promote comfort and flexibility for joint sufferers. Formulated by Blessed Herbs master herbalist and renowned naturopathic physician James Sullivan, these joint relief supplements are unique because they take a 3-pronged approach to joint health – restoring comfort to swollen areas, promoting mobility and stimulating the body’s own joint tissue repair with synergistic nutrients derived from natural herbs. The Blessed Herbs Joint Relief contains a carefully crafted combination of the most potent herbs, researched and sourced by the herbalists at Blessed Herbs. The natural blend of boswellia, turmeric, white willow and tart cherry work together to relieve joint discomfort, irritation and stiffness. Ginger, holy basil, celery seed and devils claw help to promote healthy circulation and maintain healthy fluid levels between joints encouraging the body’s natural healing process and promoting muscle and connective tissue health. Respect your body and only put in what you understand. Many over-the-counter supplements contain ingredients which are of no use to your body and you can’t even pronounce them never mind understand what they are! 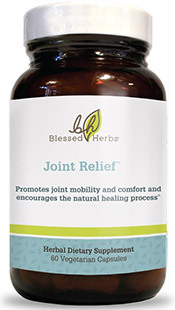 Trust in Blessed Herbs Joint Relief to protect your joints and reduce stiffness, irritation and discomfort.